You want to go to China to study or work? The key to open this door is the HSK certification (Hanyu Shuiping Kaoshi - 汉语 水平 考试). It is the basis for schools in China to receive international students and for companies and organizations to recruit staff. Want to join HSK courses but can’t afford it? Don’t worry, HSK Test - Free Chinese test and vocabulary will solve that problem for you. 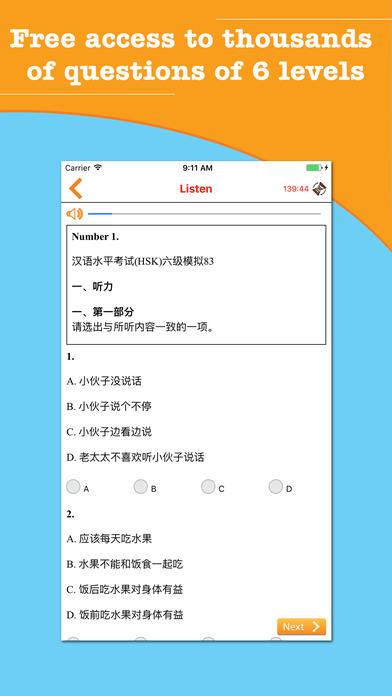 Download our app now, and practice lots of HSK tests…. FOR FREE! With over 3000 questions available, you will have a chance to practice many sample tests of all 6 levels. Our app prepares the necessary skills for you so that you will have no difficulty in doing the real test. You can improve your skills with our app as we continuously update new data. So wait no more, download HSK Test - Free Chinese test and vocabulary today and get your certificate right away!